Dazzling flowers at the Autumn Flowers Show not only pleased the flower lovers but also sparked passion for growing and nurturing plants and flowers. The three-day traditional Autumn Flowers Show, which is an annual feature in the federal capital, began here at Rose and Jasmine Garden on Friday in the midst of mild autumn in Islamabad. 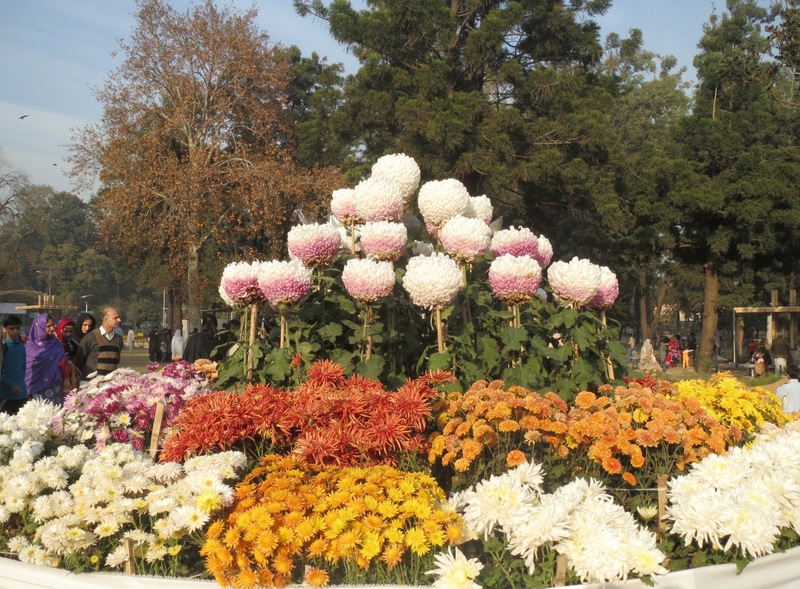 The 32nd Chrysanthemum Autumn Flowers Show 2014 organized by Islamabad Horticulture Society, Capital Development Authority (CDA) and National Horticultural Society to promote gardening, tree planting, parks and public green spaces. “Flowers are special gift of nature and meticulous ministration is needed to preserve this gift,” said Member Environment Capital Development Authority (CDA), Syed Mustafain Kazmi who inaugurated the flowers show. He said that healthy environment leads to healthy attitudes and flowers contribute greatly to healthy environment. Numerous varieties of Chrysanthemum particularly intermediate, incurred, reflex, sprays, anemone, pompons, Korean hybrid and spidery flower were displayed in mound, stall and rainbow orders at the flower show. Miniature gardens, stand flowers and vegetable stalls also feature at the event whereas while flower arrangements competition among the ladies are also been arranged. Various organisations including Pakistan Air Force (PAF), Islamabad Club, COD Rawalpindi, Shifa International Hospital, PAF Hospital, CMH Rawalpindi, KRL have set up their stalls at the Autumn flower show.